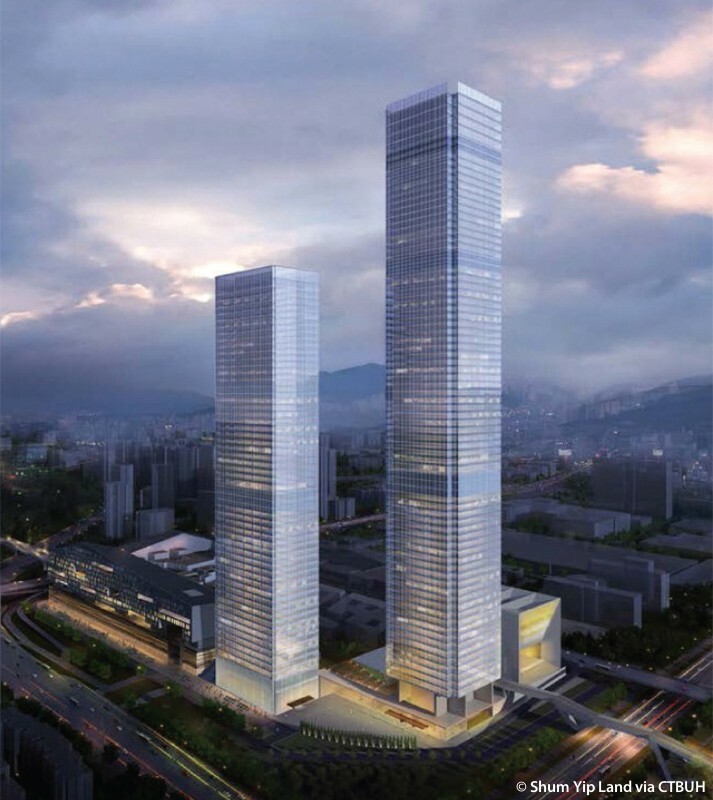 Located just north of Shenzhen’s main central business district, Shum Yip Upperhills Tower 1 is the tallest building within a large complex of six towers and a series of low-rise buildings surrounding an elevated pedestrian space linking two large parks directly to the east and west. 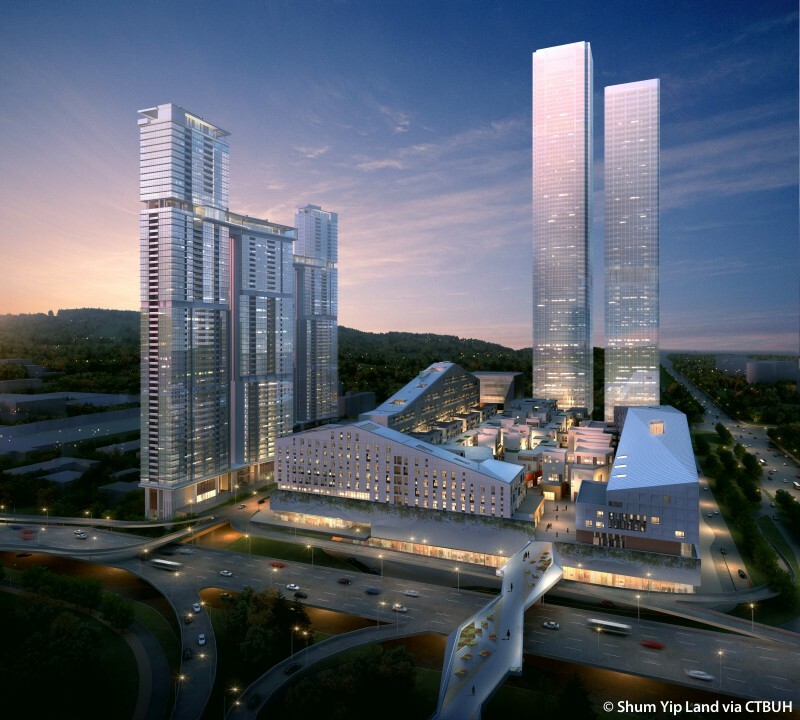 Shum Yip Upperhills Tower 1 was from the onset designed as a pair of towers, drawing inspiration through the power of having two buildings rather than one in order to reinforce the landmark status of the highly visible project. Designed as a columnless building with an entirely flexible interior, Shum Yip Upperhills Tower 1 was framed as a composite structure with a reinforced concrete core and two very large steel super columns on each edge of the tower with steel floorplates strung between them. This is in contrast to Tower 2, which was also framed with steel floorplates and a reinforced concrete core, but has a grid of hollow steel box columns making up the perimeter structure. The façade is made up of custom designed glass modules with individual glass panes spanning 3 meters wide by 3.5 meters high, essentially the dimensions of a single office and about as large as single glass panes could be in a high-rise application at the time of design. This allows for floor to ceiling windows to maximize views while creating the illusion of nothing between the occupants and the outdoors. Shum Yip Upperhills Tower 1 is functionally split between office and hotel uses with the hotel’s event spaces positioned in a separate structure beside the tower. Known as the ballroom pavilion, it was designed around an outdoor terrace at the center of the structure providing an outdoor function space overlooking the neighboring Beacon Hill Park to the east and doubles as the hotel’s main entrance. The city of Shenzhen put a strong emphasizes on the interaction of the complex with pedestrians due to the location between Beacon Hill and Lotus Hill Parks. The city sought to seize the opportunity to establish a linkage between the green spaces when the complex was proposed for what was once an industrial park. As such, the project creates a direct passage through the block linked by elevated bridges crossing the arterial roads which flank the site to the east and west. 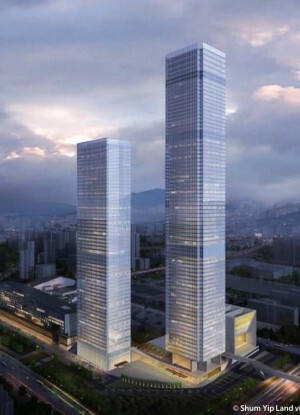 The unique public space created ensures Shum Yip Upperhills Tower 1 and the greater complex will be an important part of the local cityscape for years to come.